Since I moved to Sydney this year, I’ve found that commuting has become a regular part of my routine (about 8 hours a week). So to fill the void, I’ve been devouring all manner of radio plays, recordings, and audio books: dramatised mysteries by Dorothy Sayers and Agatha Christie, audio readings of dystopian novels (e.g. Brave New World and 1984: somehow, dystopia is very believable when one is commuting), Alastair Cooke’s wonderful Letters from America (I love these, and am working my way slowly through various decades). But my greatest discovery has been the Tom Hollander reading of Anthony Burgess’s A Clockwork Orange. This is an absolutely astonishing vocal performance: in this case I think the recording actually surpasses the original text – or rather, it carries the text through to perfection. 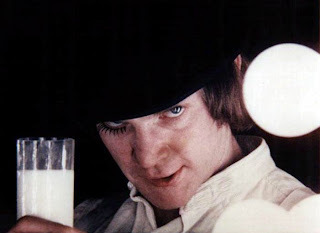 In this performance, the formidable avalanche of Nadsat (the fictional slang dialect in which the first-person narrator speaks) becomes immediately intuitive and comprehensible – more than that, the language becomes utterly gripping, sometimes sinister, often hilariously funny, at times hauntingly poetic and deeply moving. I reckon this performance makes it clear that the whole novel is primarily about language itself: about the worlds language creates, the worlds it divides, the worlds it destroys. Believe me, O my brothers, to sloosh that chelloveck govoretting all those bolshy slovos is real horrorshow. Very, very horrorshow. So, anyone else know of any good audio books? I just finished this one tonight, so I’ll soon be scratching around for something new. On another note, I just noticed that F&T had its one-millionth visitor today: welcome!